We love costumes in our house. It's not unusual for one or both of the children to don at least one costume a day. 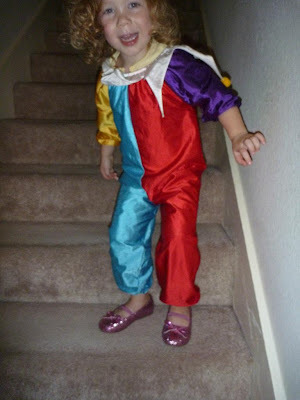 Today Rachel had on a colorful clown costume which she was quite excited about. Then she leaned over and announced, "Look Mommy! I have a red and blue bottom!" I guess the clown costume really did help her get a laugh!